Get a load of this flavorful Healthy Living Cheesy Salsa Meatloaf! 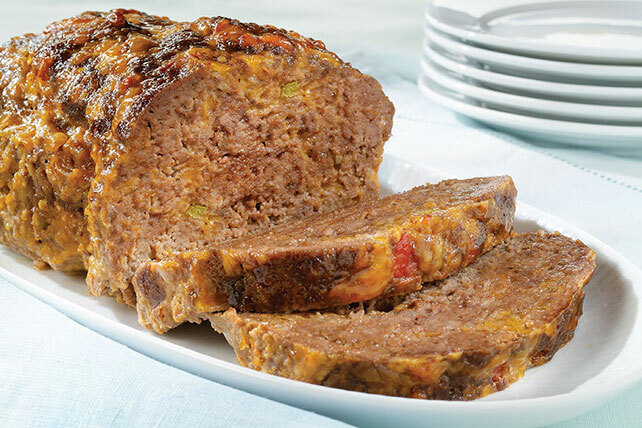 With garlic, cheddar cheese and chunky salsa, our Cheesy Salsa Meatloaf is terrific. Preheat oven to 400°F. Mix all ingredients until well blended. Shape into loaf in 9x5-inch loaf pan. Bake 1 hour or until center is no longer pink. Remove from oven. Let stand 3 minutes before removing from pan. Cut into slices to serve. Prepare as directed, using extra lean ground beef and KRAFT 2% Milk Shredded Reduced Fat Cheddar Cheese to save 70 calories, 11g of fat and 5g of saturated fat per serving. Cook meatloaf until meat thermometer inserted into center of loaf registers 160°F and meatloaf is no longer pink in center. Prepare as directed, substituting BULL'S-EYE Original Barbecue Sauce for the salsa.